The Swiftpoint mouse is designed to take over for your old laptop touchpad - and save you from throwing the thing out the window after 7 hours of dragging your fingers slowly around, mis-clicking and generating massive amounts of rage. Swiftpoint is a New Zealand based tech company that designs intuitive computer peripherals to help make these metal boxes we all use just that much easier to get along with. They've released a number of odd and innovative PC mice such as the "Dolphin" and the "Susan", but these have just been steps on the larger journey to what they consider to be the epitome of laptop mousing - the Swiftpoint. The Swiftpoint aims to include the usability of a typical PC mouse but have it fit on the palmrest of a laptop - no small feat. The New Zealanders took some time in creating a design that is not only slick, but apparently quite usable. 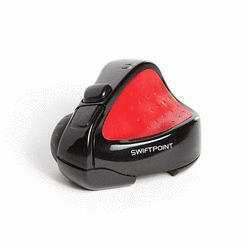 Less than half the size of a "typical" mouse, the Swiftpoint offers both left and right click functionality from a set of buttons mounted on the top of the unit. The rear button is right click and the front is left, a fairly natural state of being for most of the right-handed American population. The Swiftpoint also features a wireless USB connection - simply plug in the small USB tab and the mouse is ready to go. The USB device also features a magnetic connector so that the mouse can be securely held while the laptop is in transport. Perhaps the biggest innovation the Swiftpoint brings to the table is the pen-like grip on the left side of the mouse. It allows for not only easy, two-fingered operation, but for the mouse to be tilted up on edge as required, making it simple to use in the limited real estate available south of a laptop keyboard. From all accounts, the mouse is quick and responsive, and is 30-40% more efficient than using a traditional touchpad. It's currently available for purchase at both the Swiftpoint store and Amazon for those that are interested. We will say "but", because we'd be remiss in not saying it, and we have a few concerns. The first is the "magnetic connection" that holds the mouse to the laptop. Sure, it works, but do you really want to be carrying your mouse around sticking out of your laptop like that? Even if you've never run into a wall or dropped your laptop before in your life, you'd be almost guaranteed to do so once you had an expensive peripheral connected. Second, the website says that the wireless charge on the mouse should last 2 weeks, but unless wireless mouse charging has come a long way in the last year, that seems unreasonably high. A mouse crapping out mid-point can be almost as frustrating as the touchpad typhoid most of us get after prolonged laptop use. Still, this is an impressive little piece of technology, and we're happy to...point you...in it's direction. What a great buy.It is fantastic to use and performs as stated.Highly recommend, this thing is cool.!!! Awards will be coming down the line for this gadget. Well done NZ.